Bo Bice is an American singer and musician who was the runner-up against Carrie Underwood in the fourth season of American Idol. 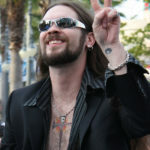 Prior to auditioning for American Idol, Bice released a solo album as well as a few albums with his bands while performing in the night club circuit. In 2005, Bice charted at number two on the Billboard Hot 100 with a rendition of “Inside Your Heaven” from American Idol. He released the album The Real Thing after American Idol to minor success before being dropped by RCA Records. He started his own record label Sugar Money and subsequently released two more albums, See the Light and 3. As of 2014, he is also the lead singer of the touring version of Blood, Sweat & Tears. "I try to be a better dad and husband than I do pretend rock star."